We all know you love jalapeno peppers, but they're amazingly delicious when they're stuffed with wonderful ingredients and cooked through. You don't need to get crazy with ingredients, although you can if you'd like, but for this recipe, we chose some very basic cheeses and kept it simple. We grilled 'em! Cut off the stems from the jalapenos and core them - basically, remove the seeds and innards. If you have trouble, check out our video on this. Stuff each jalapeno with about 1 ounce of cheese mixture. NOTE: jalapeno peppers will vary in size, so just stuff in as much cheese as you can fit. 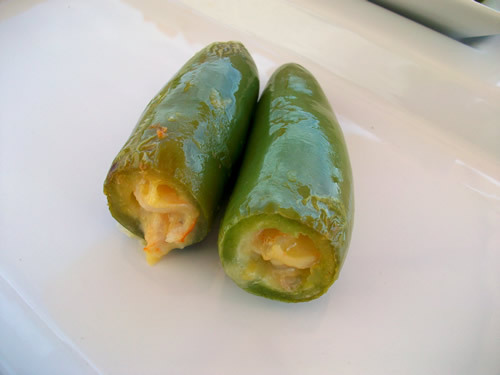 Wrap each stuffed jalapeno pepper in tinfoil. Heat grill to medium and add stuffed jalapenos. Grill over medium about 20 minutes. You can leave them on longer if needed to time with other food that you're grilling. Remove from heat, unwrap, and serve! NOTE: These make an excellent side dish to any grilled meal, but they're great for snacks as well.